may abound to every good work..."
1. A Little Bit Pantry by The Blessed Hearth ~ I don't know about you but I love peaking into other people's pantries! It's a little hobby I have ;) Faye invites us into her old fashioned blue and white pantry... Would you like to come along? 2. Bavarian Apple Cheesecake by Parlor Room Ponderings ~ Diane (who has such a lovely and peaceful blog) shared a delicious looking dessert this week! Take a visit over and enjoy a slice of cheesecake! 3. DIY Perfect Cream of Chicken Soup by Yellow Birch Hobby Farm ~ Most of my recipes for foods containing those red and white soup cans got canned once I began reading labels. With Erin's homemade recipe, I can bring some menus back to our table! 4. Simple Seed Germination Test by Grow a Good Life ~ This author shares a way to test your seeds before you take up precious garden space! There is so much valuable gardening information shared on this blog! 5. 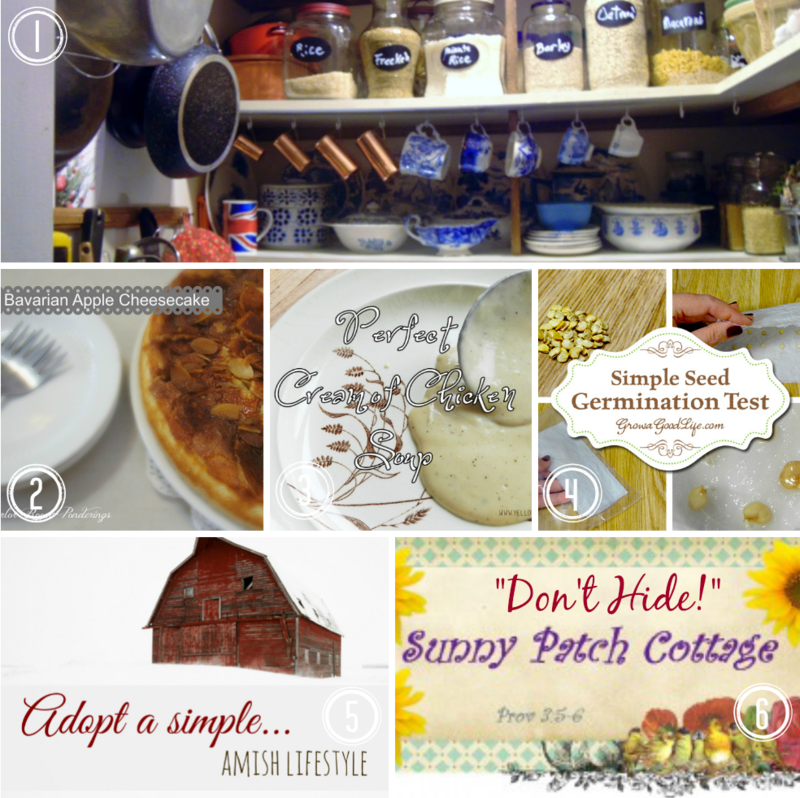 Adopt a Simple Amish Lifestyle by Our Simple Homestead ~ I think the title says it all. If you are looking for ways to create a simpler lifestyle, dear Tracy is such an encouragement (also our #1 viewed post this week)! 6. Don't Hide by Sunny Patch Cottage ~ Lastly, Mrs. Abella encourages every single one of us to quit being hindered by our individual vices and to battle them straight on! We are needed in service to the King and it is time to change those bad habits that are holding us back. Thanks for the lovely party and have a nice day JES! Thank you so much for hosting and featuring my, "Simple Seed Germination Test" post! I have joined in again this week! Thanks again! Thanks for the wonderful party, JES! Good morning, my dear! Thank you for another wonderful party :) I always look forward to linking up with you and meeting new ladies. The features were lovely! I There are a few that I did not get to visit last week so I will enjoy doing so now. Hugs and blessings! What a great collection of helpful posts! Love the vintage image, too. 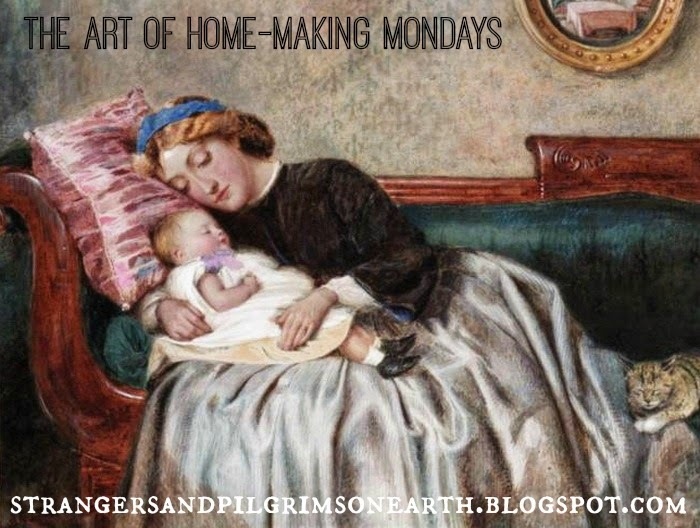 Have a great home-making week, JES! Thanks, JES, as always for hosting! Your blog is lovely and I'm now following you too! It's a pleasure to join your party today - thank you so much for hosting. I'm off to meet other ladies who are at your party today. Thank you for stopping by and for leaving your kind comment. Thanks so much for your linkup and your blog. I look forward to coming back more often.